Jouni Inkala was born in 1966, in Kemi, Northern Finland, and lives in Helsinki. He studied cultural history, literature and philosophy at the Universities of Oulu and Helsinki. Between 1991-1994 he worked as a lecturer, teaching literature at the University of Helsinki. He has published eight collections of poetry and been a regular columnist in several newspapers. His recent books include Kirjoittamaton [Unwritten], 2002; his selected poems, Minuutin ja sen puolikkaan laajenevassa universumissa [In one and a half minute’s expanding universe] 2007; and Minkä tietäminen on ihmiselle välttämätöntä [In which knowing is unavoidable], 2008. 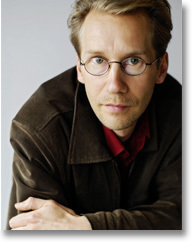 In 1992, he received the J. H. Erkko Award for the best first collection of the year and also the Kallioniemi-säätiö Award. In 2005, he received the Einari Vuorela Poetry Award and in 2008, a bursary from the WSOY Literary Foundation. His poems have been translated into 20 languages and have appeared widely in magazines and anhologies outside Finland.